Chef and cooking teacher Rodney Dunn, of Tasmania's farm-based cooking school the Agrarian Kitchen, and this year's Santa Vittoria Regional Restaurant of the Year - the Agrarian Kitchen Eatery & Store, prepares a spring feast. At both the cooking school and eatery we make our own ricotta and goat's cheese. Although most people don't realise it, milk is a seasonal product, produced after kidding. I also love to use artichokes, shunned by many. With a little work they are a true joy of springtime eating. 1. In a food processor combine ricotta, goat's cheese, rice flour, eggs and salt and process until smooth. 2. Line a teacup with a piece of plastic wrap allowing plenty to overhang and spray with non-stick oil. Spoon a quarter (about 150g) of the dumpling mixture into the lined cup and twist plastic wrap to enclose then tie a knot to secure. Repeat with plastic wrap and mixture to make four dumplings. 3. Place dumplings into a bamboo steamer over a pot of boiling water to steam until just set, about 15 minutes. 4. For braised artichokes, prepare artichokes by removing outer leaves and trimming top. Peel outside of artichoke stalks. Halve artichokes lengthways and, using a teaspoon, remove hairy choke, then halve again into quarters. Place artichokes into a bowl of acidulated water (water and lemon juice). 5. Heat oil in a large deep frying pan, add thinly sliced onion and a pinch of salt, then cook over low heat until soft, about five minutes. Add artichokes and 125ml water, cover and gently cook until artichokes are tender, about 8-10 minutes. Allow to cool slightly then stir through torn mint leaves. 6. Heat sunflower oil in a large saucepan to 180C, add shaved onion and fry until golden brown, about eight minutes, then using a slotted spoon remove to a plate lined with absorbent paper. 7. 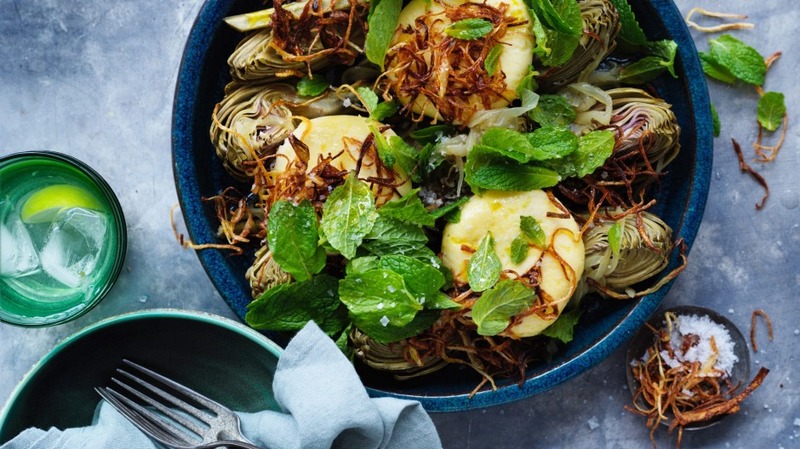 Spoon braised artichokes onto serving plates. Remove dumplings from plastic wrap and place on top, then a garnish with handful of fried onion and serve. I love to eat flounder; it has the sweetest flesh, especially when cooked on the bone. Cooking fish on the bone ensures it retains moisture and when possible it is my preferred way. 1. Remove the broad beans from the pods and the tips from the asparagus. Cut the asparagus stalks into 1cm pieces and spring onions into 3cm pieces. Bring a large saucepan of salted water to the boil, add broad beans and cook for 1-2 minutes, scoop out of water, drain and refresh under cold running water. Add asparagus stalks and tips to boiling water and cook for 1-2 minutes, scoop out, drain and refresh. Finally, add the spring onions to the boiling water and cook for 1-2 minutes, scoop out and refresh. Peel broad beans, combine with blanched asparagus and spring onion and set aside. 2. Preheat oven to 220C. Divide flounder between two oven trays and rub with olive oil. Season generously with salt and roast until just undercooked, about 12 minutes. 3. For seaweed butter, heat butter in frying pan until sizzling. Add ginger and cook until fragrant, about 1-2 minutes, then stir in nori, lemon juice and soy sauce. 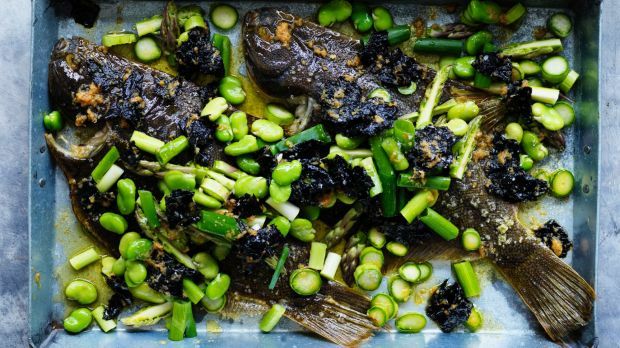 Spoon seaweed butter over flounder, scatter with double-peeled broad beans and asparagus and serve immediately. Strawberries are the first of the berries to appear and in our garden that's worth getting excited about. They are the perfect match for rosewater – just be careful not to overdo it. The shortcake is light in texture, somewhere between sponge and biscuit. 1. Combine strawberries and sugar in a bowl and set aside. Preheat oven to 190C. Prepare an oven tray by lining with baking paper. 2. Combine flour, baking powder, salt and castor sugar in a bowl, add butter and rub together using fingertips until the mixture resembles coarse breadcrumbs. Add milk and stir until mixture begins to come together as a very soft dough. 3. Spoon four even spoonfuls of mixture onto the prepared oven tray and bake until golden brown, about 12 minutes. 4. For rosewater cream, combine ingredients in a bowl and whisk until firm. Refrigerate until required. 5. 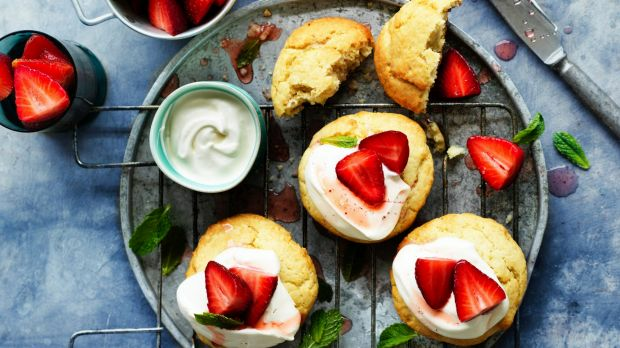 Place shortcakes onto serving plates piled with strawberries and cream.